Victor Monteiro from Brazil imagined an elongated shape for the Samsung Galaxy S IV and he designed a new concept based on his ideas. We’re dealing with a 6.8 mm thin device, with a 4.8 inch “HyperAMOLED” screen with 1080p resolution and Corning Gorilla Glass 3 protection. Under the hood we’ve got an Exynos 5X2 chipset, a quad core Cortex A9 1.5 GHz chip and a quad core Cortex A10 2 GHz one, so it’s safe to say we have an 8 core device here. 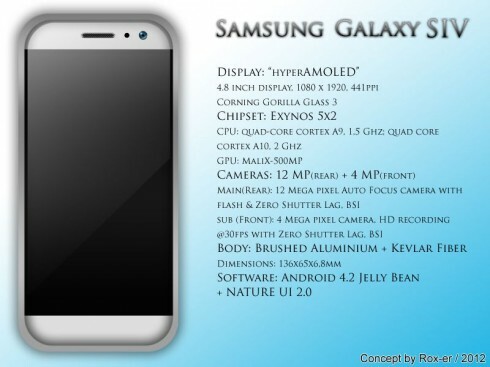 The GPU is MaliX 500 MP and other features include a 12 megapixel camera at the back and a 4 megapixel front camera. The main camera has zero shutter lag, BSI and autofocus, plus flash. The long body is made of brushed aluminum and kevlar fiber, so it borrows from the iPad and the Motorola Droid RAZR. As far as the OS goes, we’ve got Android 4.2 Jelly Bean and Nature UI 2.0. For some reason this design makes me think of a futuristic Nokia. Also, this would be the first Galaxy S without a physical Home button, so maybe we’re dealing with gesture control here.